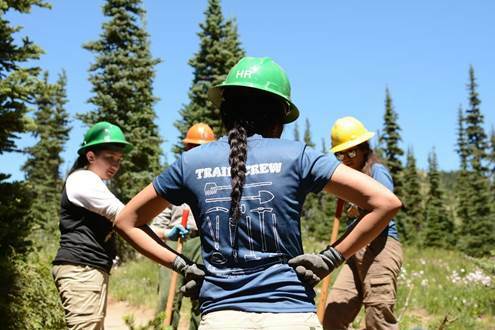 The All Girls Trail Crew is open to Latina youth ages 14-18 who live in Washington state. The crew will be spending a week engaging in stewardship and care of Mt. Rainier National Park, while also hiking and camping in this iconic park. Youth participants will be paid a $150 stipend for their work, and are receiving gear donations for future adventures courtesy of MSR and REI. In 2017 and 2018, the crew built trails, explored rivers and had important and meaningful conversations about diversity in the outdoors. The girls left the program feeling inspired and having contributed over 30 hours of volunteer trail work each. We're looking forward to another great trip in 2019! Questions: For Questions about this event, please contact Clarissa Allen with Washington Trails Association at 206-678-2025 or clarissa@wta.org.